Eight United States presidents were born in Virginia, which is why the state's nickname is "The Mother of Presidents." With the scenic Blue Ridge Mountains on one border and beautiful Atlantic beaches on the other, Virginia offers something for everyone. 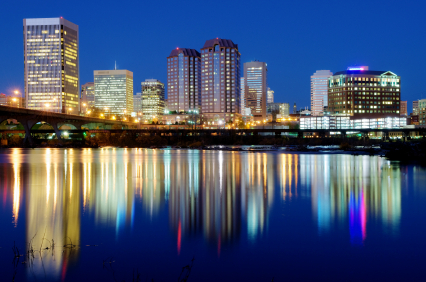 The largest city is Virginia Beach, with Richmond coming in a close second. If you are thinking of moving to Virginia, you should understand the minimum requirements for car insurance before you move. It can be daunting to search for car insurance in an area you are not very familiar with, but taking advantage of online insurance quotes can make the process much easier. You can compare quotes from several Virginia car insurance companies so that you are able to make an informed decision about which company to choose. You should never settle for an overpriced policy just because you are new to the state. Current Virginia residents will also find that a good insurance quote comparison is an excellent way to make sure they are always paying competitive rates. When you need to renew your policy or make changes it is a great time to compare quotes and learn about possible discounts you could earn on your insurance. UM coverage should match the amount of bodily injury insurance purchased and cannot be less than the legal requirements for bodily injury insurance. How much will you pay for car insurance in Virginia? Find out by entering your zip code below. New Virginia residents must get a Virginia driver's license within 60 days of moving to the state. The rules for what constitutes residency are vague in Virginia. Only the state tax code addresses the definition of residency and even that is not so clear. The tax code defines a resident as, �A person who lives in Virginia, or maintains a place of abode here, for more than 183 days during the year, or who is a legal (domiciliary) resident of the Commonwealth is considered a Virginia resident for income tax purposes.� A legal resident only needs to have a Virginia address and the intent to remain in the state. Under these rules, one could theoretically wait 183 days before the 60-day clock to getting a license starts ticking. Non-residents temporarily living in Virginia can stay without getting a license for six-months. There are also exceptions for military personnel and students. If you already have a valid license from any US state or territory, Canada, France or Germany, you may not need to take the written and road tests or show proof of driver�s education courses. You will still have to pass a vision test, whether you have another state license or not. Another requirement is that your out of state license must have been in effect at least 60 days before you apply for the Virginia driver's license. You may have to prove the date you were issued your out of state license if there is no issue date displayed on it. You�ll also have to clear up any suspensions on your out of state license before Virginia will issue a license to you. A Virginia driver's license is valid for eight years. It expires on the applicant�s birthday. Licenses are not expensive, costing only $4.00 per year. Most drivers prefer to secure the eight-year license at $32.00. You must apply for a Virginia title within 30 days of moving there. You cannot register a car in Virginia without a title in the state. The first step is to insure and title your car. You can then have it registered. Most Virginians choose a two-year registration. It does not save any money on fees, but is more convenient because it does not need renewal for another two years. Registrations can be renewed online, by phone or by mail. Keep your registration card with you whenever you drive the car. Registering your car gives you two license plates, plus two decals to apply on the plates that show the plate expiration date, and a registration card. You will also need to get a Local Sticker or Decal within 30 days of moving to Virginia. Some local areas also require a vehicle registration. Before you can operate a car in Virginia, you must pass the annual safety inspection. The inspector will provide you with a valid safety inspection sticker. If you drive without a valid inspection sticker, police can ticket you, resulting in a fine and a black mark on your driving record. The emissions inspection sticker is valid for two years and can be secured at a certified emissions inspection station. Virginia has strong inspection standards and requires you to get a sticker before you can register the car if the car is garaged in Arlington, Fairfax, Loudoun, Prince William, or Stafford counties; or the cities of Alexandria, Fairfax, Falls Church, Manassas, or Manassas Park. Some inspection stickers from other states are considered valid in Virginia. So if you are registering for the first time in Virginia and have a valid sticker from Arizona, California, Colorado, Connecticut, the District of Columbia, Georgia, Illinois, Indiana, Maryland, Massachusetts, Missouri, New Jersey, New York, North Carolina, Ohio, Oregon, Pennsylvania, Tennessee, Texas, Utah, Washington, or Wisconsin, you do not need a new Virginia inspection sticker. Virginia inspection fees are about $28, depending on the age of your car. Additional fees are charged on older cars to cover the cost of the emissions testing program. The State of Virginia requires all cars carry minimum insurance coverage. The law demands you carry $25,000 coverage for the bodily injury or death of one person, $50,000 coverage for the bodily injury or death of two or more, plus $20,000 for property damage insurance. Unlike other state, Virginia offers an option to go without auto insurance for drivers who cannot afford it. You can pay a $500 uninsured motor vehicle fee (UMV). The fee does not give auto insurance, it only allows drivers to register and operate the car for one year without insurance coverage. If you register your car, don�t buy insurance and fail to pay the UMV fee, you can be fined $500, have your license suspended, face registration suspension for all vehicles with your name on the title (even co-owned cars) and pay higher premiums for three years. Insurance companies notify the DMV immediately whenever you cancel or add or remove a vehicle on a liability policy. Registered cars must carry insurance (or have a paid UMV fee) even when the car is broken or not being used on the roads. You can be sure you are getting the best rate on your insurance by checking with at least three insurance companies before settling on one. Simply enter your zip code in the box at the top of this page and you will get a quick and easy free quote for auto insurance. If your family has two cars, be sure to check quotes with both vehicles on the same car to get a multi-vehicle discount. You also may qualify for new customer discounts, low mileage discounts and more. Be sure to ask about all discounts that you might be due. It's easy to get free auto insurance rate quotes in Virginia. It's critical that you take the time to get car insurance, because residents will be forced to pay at least a $500 fine if they aren't carrying car insurance. There are a few people who are against the very idea of insurance as it is a contingent expense. It also brings out the subject of death or grave injuries which skilful drivers thiok they will never be a part of. The fine may allow them right to get registered as an owner and buy more cars. Short of both options, you may be severely restricted in your quest to drive in Virginia. The insurance coverage demanded is $25,000 dollars for injuries, $50,000 for accidents and $20,000 dollars for serious property damage. In case you are uninsured and broke, you don't have a lot of options. You may have to pay further $500 if you have caused an accident and stand uninsured. You may get your license and registration papers revoked or get a negative driver warning and the Motor Body passes your name to all traffic inspectors. Having insurance is just a way to steer clear of these problems. The insurance quotes provided by many agents are often quite alluring. There are avenues where you can negotiate. There is quite a competition among insurance companies and as a result, you get to pay affordable premium, save money and also get flooded with bonus offers. You may even get online insurance that is provided by many frontline companies to tap rich but lazy owners.